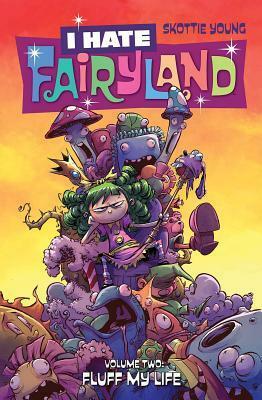 Image Description: The book-cover of I Hate Fairyland, Vol. 2: Fluff My Life by Skottie Young. The background is a collection of Fairyland creatures assembled together so that they form a throne. Their faces are grotesque and yelling. The foreground features Gertrude, her hair is bright-green ringlets in pigtails with a yellow ribbon in her hair, and her dress is bright pink with a yellow sash across the middle. She is sitting on the throne of fairyland creatures with her head in her palm looking bored. Skottie Young has been an illustrator and cartoonist for over ten years working for entertainment and publishing companies such Marvel, Warner Bros., Image, Upper Deck, Mattel, and many more. He is currently illustrating the New York Times Best Selling and Eisner Award Nominated adaptions of L. Frank Baum’s Oz novels with writer Eric Shanower. The series has gained acclaim from both fans and critics. Skottie currently lives in Illinois with his family, Casey, Baxter and their Saint Bernard, Emma. 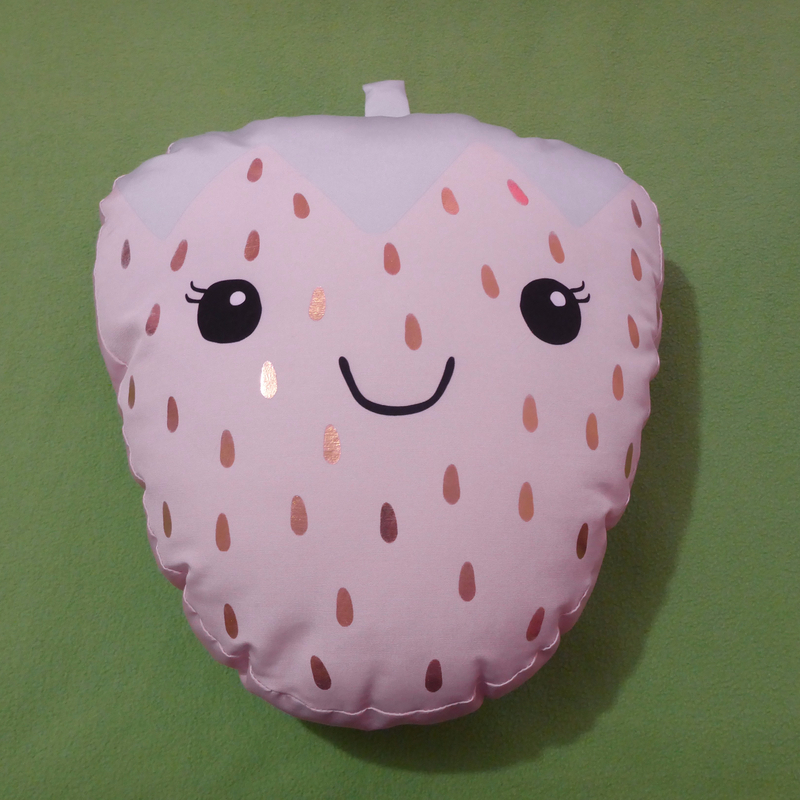 All hail Gertrude, the new Queen of Fairyland. After thirty years of wreaking havoc across this magical world to find her way back home, she must now overcome her biggest challenge yet… ruling the place she hates most. Join Gert as she continues her never-ending quest to get the FLUFF out of Fairyland. The hilariously brutal Fairytale adventure continues by superstar cartoonist SKOTTIE YOUNG. Yarr, Thar Be Spoilers Ahead, Ye Have Been Warned. ~Reality Ensues: With regarding the plot twist at the end, Gertrude becoming Queen of Fairyland instead of being able to go home was foreseeable, but also an excellent plot twist. The reality is that Gertrude is someone who has been thrust into Fairyland at the age of six, she doesn’t have the best formal education, everything she knows of Fairyland is from lived experience. It makes complete sense that Gertrude would then fail at being Queen, an administrative position that demands she remains in a throne room, instead of being out in the field (so to speak). While Gertrude was at least attempting to try and run the Fairy kingdom properly, the fact remains that if the Fairy kingdom council had the power to fire her, they probably could have removed Gertrude from her position in the first place or intervened sooner. Once again, Fairyland’s obscure system of government bureaucracy has created the problem in the first place, then failed to resolve the problem, even after it has spiralled out of control. ~Black Humour: The black humour and the grotesque art style are still there and still applied in a consistent manner, however, I feel as though if the series continues in this manner, the comedy style will become boring and predictable. Shocking for the sake of shocking. While this volume was amusing in its own unique way, the series needs to either return to a functional plot or engage in deeper character development for the main characters. You can’t keep writing the same joke over and over. ~Lack of Character Development: When the writer takes away plot elements, usually it’s to develop character arcs or moments of character growth, however, neither Gertrude nor the various side characters experience any real or long-lasting growth or development. In this volume, Gertrude does have to contend with some of the consequences of her past actions. Such as her signing bad tax-bills and keeping living beings inside her bag of holding. There are consequences, but then the status quo is maintained, and it appears as though Gertrude hasn’t learned anything or changed at all. All in all, I feel as though this volume is a breather edition to the series, just a couple of random adventures in Fairyland thrown together into one publication. While it’s possible that this volume is laying the groundworks for future plot and character development, I doubt that this is the case, I look forward to either more plot development or some character growth.